Mambo D is 17 Months!! And counting! Yes, literally. One, two, three, seven, ten! While she counts how many times she is pushed on the swing by granny Lynette, everyday. her jungle gym is up and open for business, thanks to her Gogo Marge! What. A. Lucky. Girl!!! Boy have we made some leaps and bounds this month? Words: kaka! Short for mukaka, which means milk in Shona. Amari, I was practicing both words with you, and you decided that mukaka is the one. So now we know what to call it at least. Hahahaha! Tete, ah-ah and poo. Just to add to the few she had last month. Amari repeats Poo when you ask her if she has done a big poo,which usually means yes. If you ask if she did a big poo and there is no poo, she will likely tell you ‘ah ah!’. She is such a great communicator. Pointing where she needs to go, she will signal that we must get up by pulling on your shoulders. She will point out exactly what she needs, from where it stays and as soon as she has it, wriggles out of your arms to get herself to the next destination. Amari climbs onto the couch like a pro and up and down the stairs by herself now. She loves to run away from Granny at bath time and we have to run after her, it is such a great game. She absolutely lives playing with toilet paper and when the house is too quiet, she can probably be located in the bathroom sitting on a heap of unrolled tissue. She has the most annoying habit of moving herself from breast to breast while she feeds and can be found often in the strangest positions while doing this. More recently she likes to feed upside down. I can’t even describe it. Mambo’s hair is making her mommy very happy, and although she still hates hair day, we are now able to braid it into protective styles which you can catch on the Instagram page if you are interested. 😁 We have kept it healthy with a gift from her mainini Michelle that came all the way from Ghana- talk about the gift that keeps on giving! 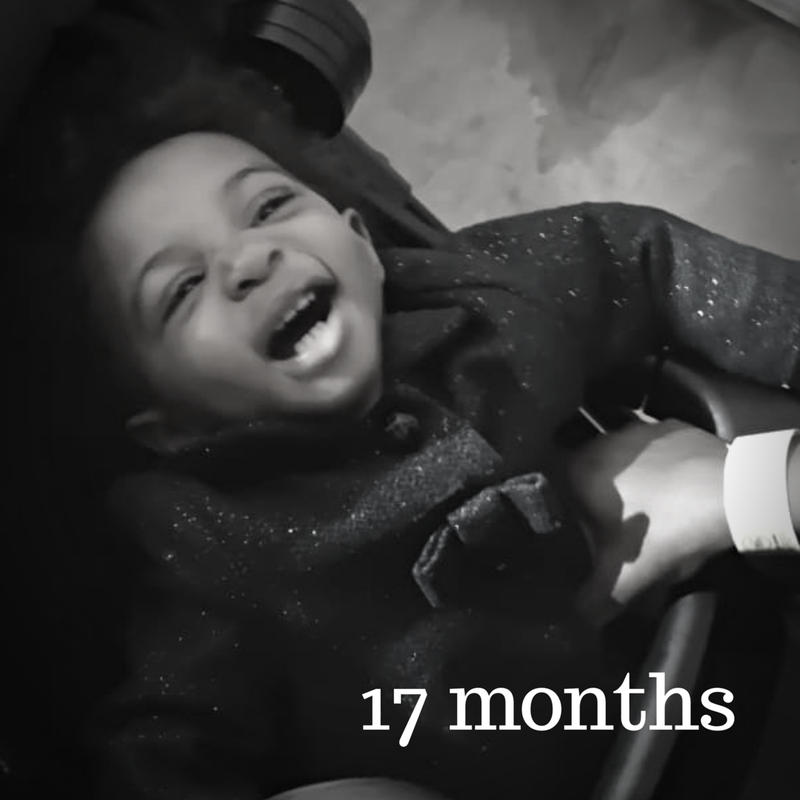 We can feel her premolars on both the top and bottom gums now, and as usual, Amari Mambo is handling them like a real queen, if she has been in any pain, we haven’t even known. Mambo loves books! One of her favorite pass times is paging through her books. She usually decides which books she wants and we all have to ‘read’ them to her. Her favorite is ‘Pop-Up Peek-a-boo: Farm’ thank you to her aunty Janine. We sincerely hope to start reading some of the other more exciting books we have soon- we will keep you posted! she also still loves to draw and can be found at her desk with her crayons and paper, creating masterpieces. Mambo has not travelled this month, we are all enjoying some home- time! Though this month she got to spend some quality time with big brother Nyasha when he and his mommy and daddy all came from Swaziland to visit. She spent a day out in Pretoria at mama OT’s which we do not get to do often and had a great time! Today is very special for us all, as Amari’s baby cousin, Muvaki, turns 1 month! We still have not seen Muvaki but are definitely very excited about our first meeting! Muvaki is no longer a neonate! Woop woop! Hopefully today Amari will join her big sissy Anashe for her birthday party and have a grand old time!